A train arrives at L’Enfant Plaza of Washington, D. C.’s excellent Metro subway system. It was my second opportunity to photograph The Metro in 28 years. 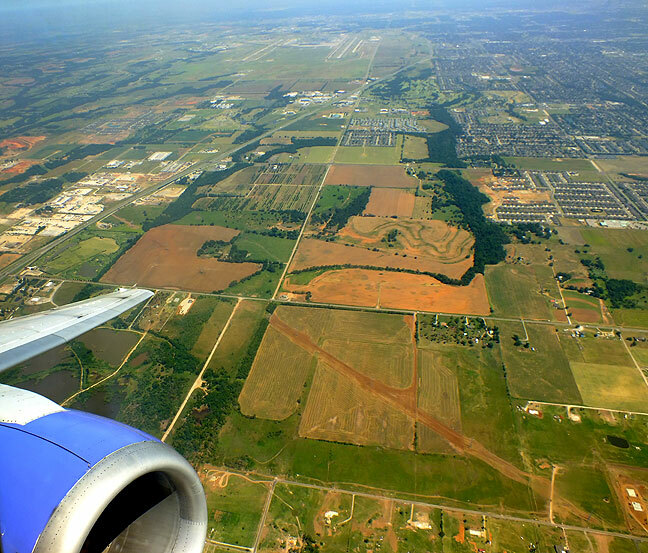 On our way: Will Rogers World Airport in Oklahoma City is visible at the top of this frame as we depart on our non-stop Southwest Airlines flight to Baltimore. My wife Abby and I flew to Baltimore to spend a week with Abby’s daughter Chele, her husband Tom, and our grandson Paul. In addition to visiting the family, we saw many of the excellent attractions in the Baltimore and Washington areas. We flew from Oklahoma City’s Will Rogers World Airport to Baltimore-Washington Thurgood Marshall Airport. We were able to secure a non-stop flight on a Southwest Boeing 737-300. Southwest is head and shoulders above any competitors as our favorite airline. Our flight was smooth and on-time, the Southwest staff were always polite and helpful, and both airports are modern and easy to navigate. Our first day in Tom and Chele’s charming home in the Baltimore suburb of Parkville was low-key, but we all had a great time visiting and playing with Paul. Tom and I photograph ourselves in a mirror at a playground where we took Paul to play. It was another fairly low-key day. We mostly played with our grandson and visited with Tom and Chele. Tom loves all things related to Star Wars, as well as all things relate to the Baltimore sports scene, so there was no shortage of conversation topics. Another satisfied P. F. Chang’s customer; Paul uses chopsticks to eat his meal. By late morning, we took Paul to a neighborhood park where he could play on the swings and jungle gyms. Despite oppressively humid heat, we all had a great time. Dinner at my request was at P. F. Chang’s, one of my favorite Chinese restaurants, which is in Towson Center not far from Tom and Chele’s house. I decided if there was a P. F. Chang’s near our home, I would be broke and weigh 300 pounds. Paul explores a tunnel in the jungle gym at a park near Tom and Chele’s Parkville, Maryland, home. Abby photographs our grandson Paul as he plays at a Parkville, Maryland neighborhood playground. Paul flirts with my camera while the family looks on. Charge! Paul loved playing this game every chance he got, including this time with Abby. Abby noted that Paul smiles and laughs more than almost all of the children we’ve known. He is a happy little boy. A National Park Service Ranger uses a sidewalk map to describe the circumstances surrounding the composition of the Star Spangled Banner at Baltimore’s Fort McHenry. Tom had to work on this day, so Chele took Abby and me to Fort McHenry, the colonial fortress on Baltimore’s Inner Harbor where Francis Scott Key wrote The Star Spangled Banner. It was hot and very humid out, but everyone seemed to have a great time. About two thirds of the way around the Fort, Abby, Chele and Paul headed for the visitor center and air conditioning, while I made the rest of the tour. It was very hot in the sun, but down inside powder magazines and living quarters, it was quite cool. Chele smiles as she steps down into a below-ground area of Fort McHenry. On the right are Abby and Paul. This is a powder magazine vent shaft at Fort McHenry. Replica cannon balls sit near the huge iron guns of Fort McHenry. A fence creates an eyeline to a cargo ship in the harbor near Fort McHenry. This bleak subterranean chamber is common to the architecture of Fort McHenry. The main portion of Fort McHenry housed these jail cells. Chele made this image of Abby “in jail” in a tiny Fort McHenry detention cell. Stairs create a nice spiral line toward daylight in this Fort McHenry storage area; due to proximity to the bay, everything underground remains damp and moldy. Abby shot this photo of Paul and me exploring Fort McHenry. It really emphasizes how small he was. Bling! Here is one of the pairs of shoes Abby bought. Tom and I stayed home with Paul while Abby and Chele went shopping for shoes, which has become a bit of a tradition when Abby comes to Baltimore. Tom and I watched Star Wars extras from his new Star Wars Blu-Ray deluxe set. Abby ended up buying mostly very lightweight hiking-style shoes, which will be perfect everyday wear. Tom photographs the beautiful and elegant World War II Memorial on the National Mall in Washington, D. C.
The U. S. Flag is reflected in the waters of the black granite reflecting pool at the Korean War Memorial. Abby decided to pass on the Washington D. C. walking tour, partly because of the heat, and partly so she could stay home with her daughter and grandson. Tom and I drove to the Greenbelt station of D. C.’s Metro subway system. The train from there into the center of the city was sparsely occupied. We changed trains at the L’Enfant station. The train from there to the Smithsonian station, which was just two stops away, was crowded and required us to stand, but was still very comfortable. 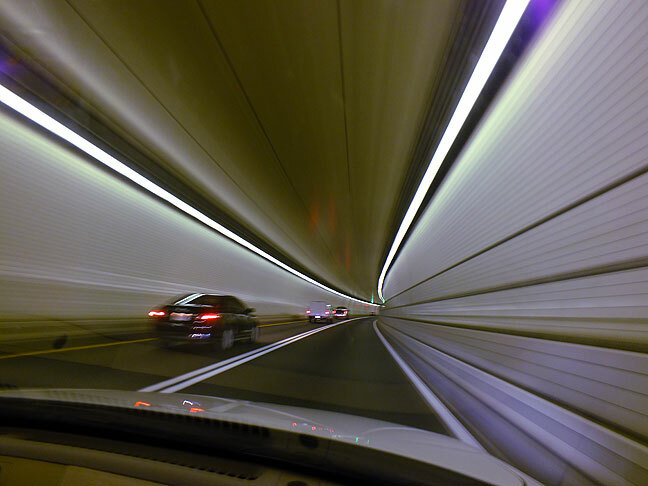 This image is a one-half-second exposure made as Tom and I drove through an Interstate highway tunnel under Chesapeake Bay. Tom and I avoided the stress of navigating the Washington, D. C., streets by using the excellent Metro subway system. The Washington Monument. It was covered in a scaffold to repair damage from an earthquake (according to Chele, “the” earthquake) in 2011. The Washington Monument wears a scaffold as it is repaired due to earthquake damage. World War II Memorial. I found it to be elegant and spacious. Since it was so early, we nearly had it to ourselves. The Korean War Memorial. This might have been the most impressive of all the monuments we saw. While comparing it to the World War II memorial, Tom said, “I felt inspired at the WW2 memorial, but here I just feel despair.” His remark left me feeling that the site had accomplished its purpose. The Lincoln Memorial. By the time we arrived it was mid morning, and several busses had disgorged a number of tourists, so it was fairly crowded. I was still able to make some fairly germane images. I also didn’t realize until I stood at it that there was a granite marker where Martin Luther King Jr. made his “I have a dream” speech. The Vietnam Veterans Memorial. I was particularly interested in seeing this because the Vietnam Veterans Traveling Wall visited Ada in May and made some amazing images. I was a bit disappointed that the permanent wall was so crowded I was only able to make a few images, and ever then felt rushed. The Traveling Wall experience was much better for me. The White House. I only stopped here to say that I had. Due to post-9/11 security concerns, you can’t actually see much of it, and where you can see it is loaded with tourists. We all probably photograph occurrences of our own state when we travel, like in this example at the World War II Memorial. National Gallery of Art Sculpture Garden. I found several interesting image opportunities here, including an elegant steel piece in the courtyard that caught a brilliant reflection from the sun, allowing me to get one of my famous sunstar photos. National Air and Space Museum. By midday, the heat was becoming oppressive and we were looking for an indoor venue. The Air and Space Museum appealed to the kids in both of us. It ended up being very fun and interesting. The National Gallery. By mid afternoon, Robert Stinson, who lives in nearby Alexandria, called and met up with us. He wanted to give us a whirlwind tour of some of his favorite art at The National Gallery, which ended up being quite fascinating. Newseum. It was about to close, so we didn’t tour it, but as a journalist, I have put it on my to do list for next time. The Capital. Our last stop was at the reflecting pool in front of the Capital building. Fairly exhausted from the events and from the heat, we sat and rested. The Capital building shines in the reflecting pool in late afternoon light. The Washington Monument wears a scaffolding for earthquake repairs. This close-up of the Washington Monument shows workers and an elevator used for repairs. The attraction was damaged in the August 23, 2011 Virginia earthquake. The south end of the World War II Memorial is dedicated to the war in the Pacific. Fountains and granite contribute to the elegance of the World War II Memorial. During World War II, families of those serving displayed flags with blue stars. If that service person died, the star was changed to gold. This display at the Memorial, the The Freedom Wall, has 4,048 gold stars, each representing 100 Americans who died in the war. In front of the wall lies the message “Here we mark the price of freedom”. Another water shot: morning light graces the fountains of the World War II Memorial. Approaching the Korean War Memorial, visitors appear to walk alongside the soldiers depicted. Soldiers depicted at the Korean War Memorial are larger-than-life stainless steel statues showing a squad on patrol. The Lincoln Memorial was crowded and noisy, but I still enjoyed stopping there. The towering pillars of the Lincoln Memorial’s interior create a sense of isolation and awe. I was particularly pleased with this extract of the huge statue of President Lincoln. Though among the most common photographs made from the Lincoln Memorial, I feel it illustrates the majesty of the location. In spite of its dignity and national significance, the statue of Abraham Lincoln was vandalized just a week after I made this image. A wilted flower stands at the foot of the Vietnam Veterans Memorial. This was as thin as the crowd ever got at the Vietnam Veterans Memorial. I felt crowded and rushed the entire time. The statue of the Vietnam soldiers impressed me more than the wall. This is more of an extract that the usual view of the three figures, and emphasizes the bleak nature of the faces in the piece. This isn’t the Wall in D. C.; this is the Traveling Wall in Ada in May, which I found more inspirational and more photogenic. The White House; I made this image so I could say I had a photo of the White House. This is what the White House experience was really like, crowded and touristy. A bronze plaque at the First Infantry Division Memorial, the “Big Red One,” lists names of the honored dead. Midday sun shines on an elegant stainless steel artwork in the Sculpture Garden at the National Gallery. An amazing steel tree adorns a section of the National Gallery’s Sculpture Garden. One of the few street performers we saw, this man juggles a volleyball, a bowling ball, and a tennis racket. As an aviator, I found the Smithsonian’s Air and Space Museum particularly appealing. The Apollo Program’s lunar excursion module (LEM) display at the Smithsonian’s Air and Space Museum. Various rockets stand on display at the Air and Space Museum. As we were entering the Air and Space Museum, I noted this unusual steel sculpture, but saw that the light was wrong, so I made a note to photograph it on the way out. When we exited the museum, the sun caught it just right. Robert Stinson caught up with us around 3 p m, and was eager to show us his favorite pieces at the National Gallery. I made this luminous rendering as we toured the National Gallery. Granite and marble make the National Gallery feel important and permanent. Bridging the space between two buildings at the National Gallery is this mesmeric illuminated moving walkway. Tom, Robert and I make a self-portrait in this complex artwork mirror outside the National Gallery. At the end of the day, Robert saw us off on our train ride back to Greenbelt station. The travel back to Baltimore was smooth and easy. Chele and Paul watch for Dolphins at Baltimore’s National Aquarium. Baltimore’s Inner Harbor is home to this excellent attraction. We knew it would be an amazing place for two-and-a-half year old Paul, but it turned out that the rest of us found the experience interesting as well. Abby was particularly enamored of the sea turtles. Despite it being our only venue for the day, we were unable to see everything by virtue of the place being so huge. At the entrance to the National Aquarium is this photogenic bubble display. Abby made this excellent overview of the inside of the National Aquarium. Paul presses his hands on the glass as he watches fish at the National Aquarium. In the lofted ceiling of the café at the National Aquarium is this complex, beautiful jellyfish mobile. Abby watches for dolphins at the National Aquarium. I spotted these mirrors in the National Aquarium and decided to make a self portrait. It was only when reviewing the image later that I saw Tom was doing the same thing. 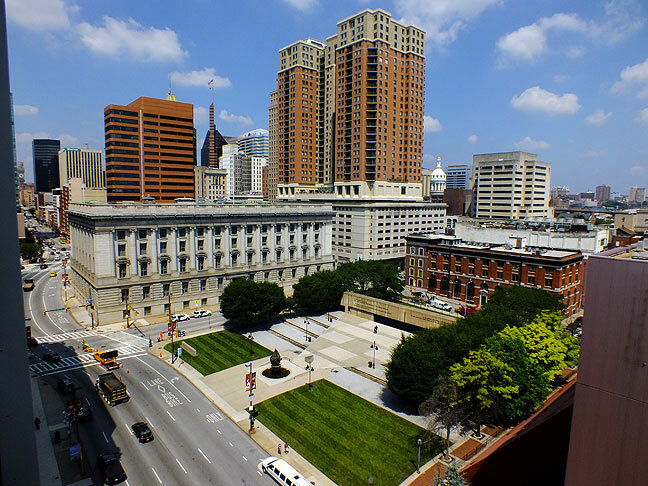 Baltimore’s Inner Harbor area is visually complex, and on my “go back” list. Downtown Baltimore shines in morning sun in this view from a parking garage near the National Aquarium. 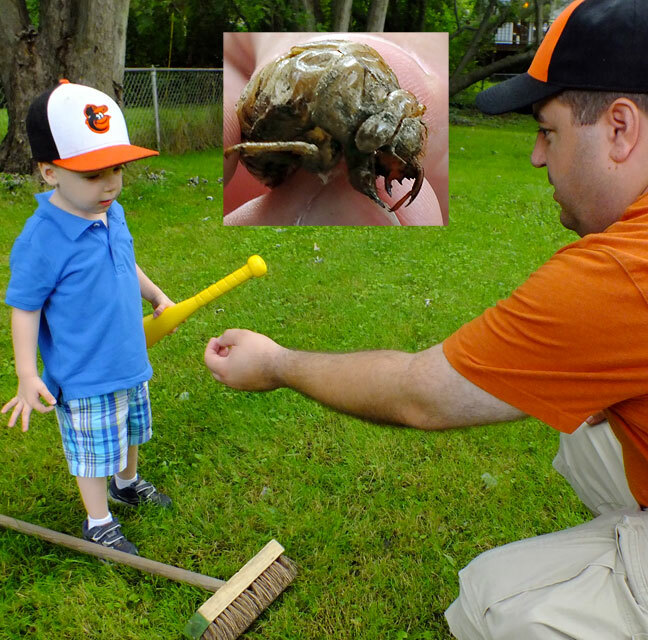 Since this was the year of the 17-year locust on the east coast, there were plenty of locust shells on the trees in Tom and Chele’s back yard, like this one Tom is showing to Paul. 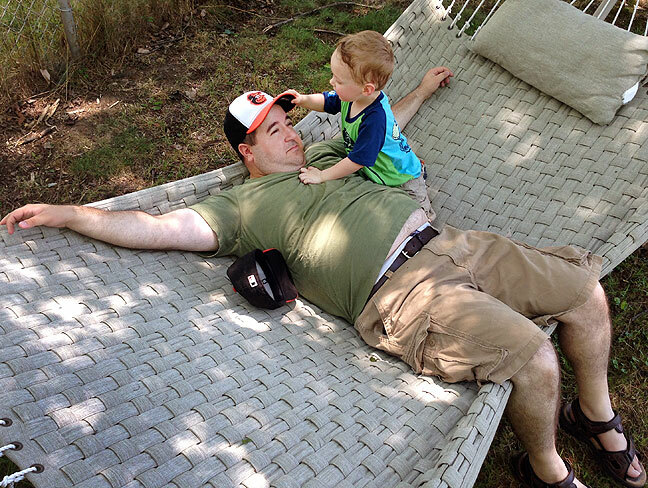 Tom and Pail play on the hammock in their back yard. Tom is a very natural, easy-going dad. 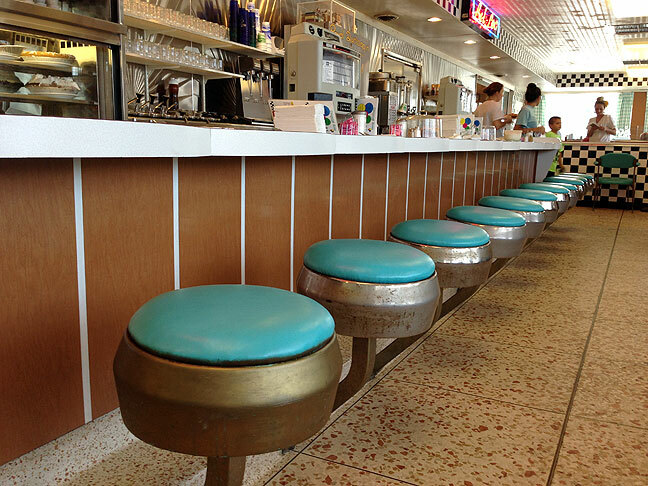 We ate at Towson’s Bel-Loc Diner twice, but I like it so much I could have breakfast there every day. We drove to Tom’s mom’s house, where she lives with her sisters. They took us to dinner at Olive Garden for what could only be described as a feast. I’ve said it before, but it bears saying again: I love traveling with my wife. I bought more bottles of water on the street in Washington D. C. that all the other bottled water I consumed in the last six months. We all wore Baltimore Orioles caps every day. Tom and I watched Star Wars items like spoofs and joke videos, as well as a rare show called The Star Wars Holiday Special, which was so terrible it became hysterically funny. Since Paul required a nap every day at 1 p m, we all took one as well. We ate twice at my favorite Baltimore dive, the Bel-Loc Diner. On one occasion, we saw retired Baltimore Orioles pitcher Tippy Martinez, most famous for picking off three runners in one inning. 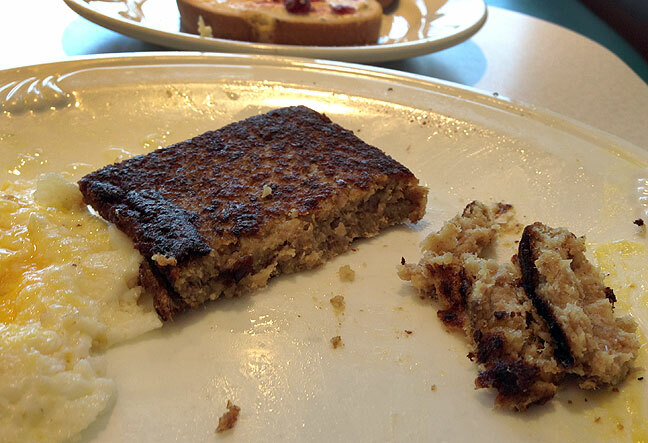 At the Bel-Loc, Tom and Chele both got a Baltimore delicacy, scrapple, which is a conglomerate of all the leftover meats from the griddle. 95 percent of my images were made with my FujiFilm FinePix HS30EXR. Abby has the same camera and shot exclusively with it. A few of my images were made with my iPhone 5. I observed these amazing towering cumulous clouds on our flight home from Baltimore to Oklahoma City. …the Greenbelt station of the Metro in 2013.